The VRM 01 and VRM 02 are axial seals consisting of 2 sections, one coated metal ring and one mould vulcanised elastomer sealing element. The metal ring protects the elastomer seal against damage, serves as a stand and support for the elastomer seal and simultaneously acts as a flinger. 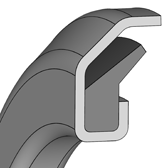 The elastomer seal is not firmly bonded to but stretched over the metal ring and is additionally held by the axial flange. With the VRM 02 the metal ring is extended in an axial direction on the outer sheath. Additional labyrinth sealing is created in combination with the circulating groove in the sliding surface. The VRM axial seal fits tightly on the shaft (press fit) and must be installed at a precisely defined distance from the metal sliding surface to guarantee the defined axial prestress of the elastomer sealing element. In rotation, the sealing lip rubs axially against the metal sliding surface at the contact pressure resulting from the selected prestress. The required sealing function is thus achieved. 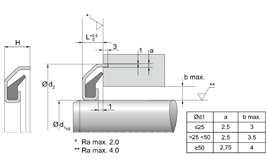 The total axial contact pressure results from the prestress in the installation housing, the geometry of the sealing lip as well as the elasticity and tensile properties of the elastomer. The VRM axial seal creates a centrifugal effect which contributes to the good sealing function. Dust, dirt and water spray from the outside are, for the most part, flung away. With increasing peripheral speeds, the centrifugal force pushes the elastomer sealing element outwards which decreases the contact pressure. Above a certain peripheral speed, the sealing lip lifts up from the metal sliding surface completely. The VRM axial seal then operates only as a gap ring and flinger. The VRM 02 additionally functions as a labyrinth seal. To achieve this, the sliding surface must be provided with a groove in which the extended metal ring can run. The VRM 02 provides additional protection due to the labyrinth in the housing groove and is used for applications with very high demands.